A black and white photograph of Reverend David Marshall. Reverend David Marshall (1890-1964) was born in Perthshire, Scotland on July 1, 1890. He studied for the ministry at the University of Glasgow and served with the Royal Army Medical Corps in Belgium and France during the First World War. He was posted to British Guiana from 1921-1929. He spent six months in Richmond Hill, Ontario in 1929 before returning to British Guiana to organize missionary work. From 1939 to 1960 he was Minister of St. Andrew's Presbyterian Church in Whitby. He was Vice-President of the Whitby War Effort Committee and Padre of the Presbytery in 1954. He died in Whitby on December 14, 1964 and is buried in Groveside Cemetery, Brooklin. 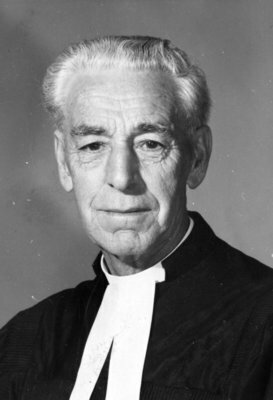 Reverend David Marshall, c. 1960, Photographer Unknown. Whitby Archives 31-008-064.